This is a recent report, and so I'm asking only if this would be "consistent with the US Coast Guard's traditional mandate." How far away from Hawaii and Alaska does the US Coast Guard's activity or jurisdiction usually extend into Asia-Pacific waters during peacetime (which may itself be an ambiguous term in this case)? The Coast Guard declined to address whether it might deploy ships to the Asia-Pacific region but acknowledged its ties to countries there. “Future ship deployments would depend on U.S. foreign policy objectives and the operational availability of our assets,” said spokesman Lieutenant Commander Dave French. But U.S. officials said privately that such action, especially the use of boarding crews, would be decided on a case-by-case and with utmost caution. I'm asking if this would be "consistent with the US Coast Guard's traditional mandate." How far away from Hawaii and Alaska does the US Coast Guard's activity or jurisdiction usually extend? This is specifically within the Coast Guard's mandate. There is no rule limiting their jurisdiction to Alaska and Hawaii. Whereas the other four branches of the U.S. armed forces are strictly military in nature and exist for the purpose of carrying out war against America's enemies, the Coast Guard actually reports to the Department of Homeland Security rather than the Department of Defense during peacetime. Although they're most known for their search and rescue operations (particularly in the Bering Sea and Hawaii), their mandate is to enforce U.S. and international maritime law. As such, the Coast Guard's duties include pretty much anything a regular police force would be tasked with, only with military authority and backing. They can operate anywhere in the world they are ordered to. Among their law enforcement duties, they are responsible for investigating and prosecuting crimes that occur in both domestic and international waters. Mostly this means things like poaching, smuggling, drug trafficking, piracy, etc. 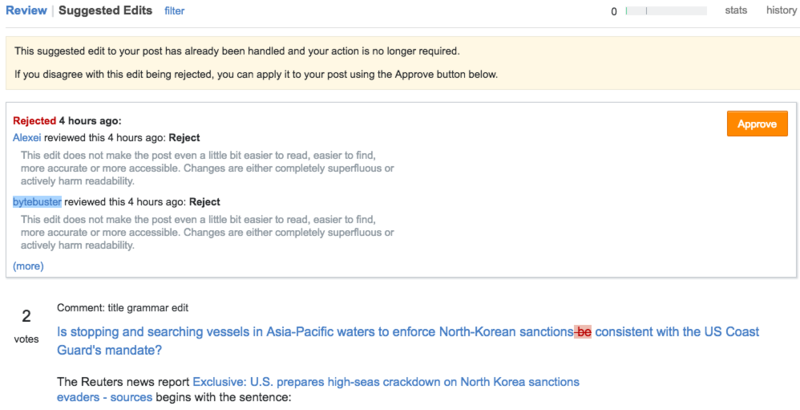 But they do have the authority (usually pursuant to international treaties or the support of international efforts) to detain and inspect any seagoing vessel that is suspected of carrying any kind of contraband material, and in this case, that includes sanctioned materials bound for North Korea. The purpose of using the Coast Guard for this activity is because it's a peacekeeping mission at its core. If a boat is found supplying contraband material to North Korea (in violation of sanctions by all its neighbors and of the UN), the idea is to seize it or turn the boat back, not blow it out of the water. The US Coast Guard is the fourth branch of the US armed forces, so they can be used in any situation that any of the armed forces would engage in. Being less heavily armed than more dedicated warships, and being painted in international coast guard colors (white with diagonal red stripe) rather than warship gray, they don't tend to be the first ships called in for major naval actions, but they are both capable and authorized to carry out military missions. This tends to be the case of the coast guard units of all major nations... not only are they a rescue and maritime police force, but they are part of that nation's armed forces, and will join in military operations if so ordered. China has sent some of its coast guard ships on anti-piracy operations against Somali pirates. The authority under which this will be carried out would be the UN sanctions. A Coast Guard cutter is less intimidating than, say, a guided missile frigate, and also less expensive to operate. Coast Guard boarding crews aren't quite as heavily armed or as aggressive as Navy SEALs, so the case by case basis would involve the potential level of threat. It is also possible that N Korean special forces on the ship may oppose the boarding, so that scenario can't be discounted... N Korea is known to take aggressive military actions without regard for the consequences, at least on a small scale. Interesting story about the US Coast Guard... In May, 1941, after sinking the HMS Hood, the Bismarck escaped the shadowing British cruisers with a night maneuver. The next day, well on its way to the Bay of Biscay and Luftwaffe air cover, it was discovered by an RN Coastal Command Catalina aircraft, which led to the final battle. Less well known was the fact that the Catalina was being operated by a US Navy crew on loan to Coastal Command, the US being a neutral nation at that time. Even less well known is how the Catalina knew where to look for the Bismarck. It had been alerted by USCGC Modoc, that had encountered the Bismarck, but being a neutral ship, the Bismarck had not attacked it, leaving it intact to radio the contact... in distinct violation of the neutrality laws. Not the answer you're looking for? Browse other questions tagged united-states military sanctions or ask your own question.